Our meat chickens are raised as nature meant them to live: in the fresh air, sunshine and rain, eating grass, insects, and soil. We supplement their diet with certified organic feed. They arrive as 1 or 2 day old chicks and live in a brooder in our barn. At three weeks we move them outside to eat, scratch, and sun themselves. They live in a large chicken tractor -- a funny name for a chicken coop and yard that we move daily. 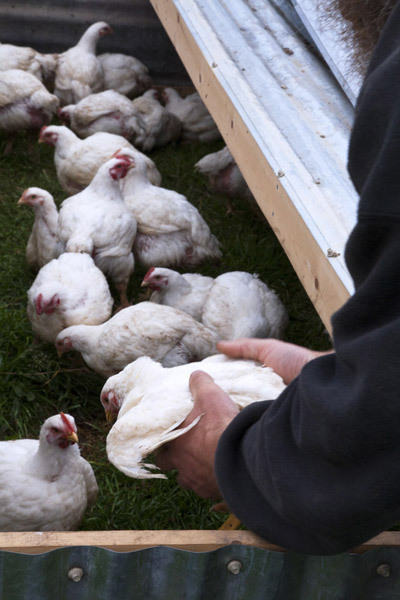 The chicken tractor keeps them safe from aerial predators, such as eagles and hawks. We process them in our on-farm WSDA/USDA processing trailer. Fresh chicken is available at our Farm Store several times a year. Frozen chicken is usually available at our Farm Store, the Bremerton Farmers Market, and the Poulsbo Farmers Market.